Artist Donald Teskey and director Lenny Abrahamson. In the background is Teskey’s portrait of the film-maker. 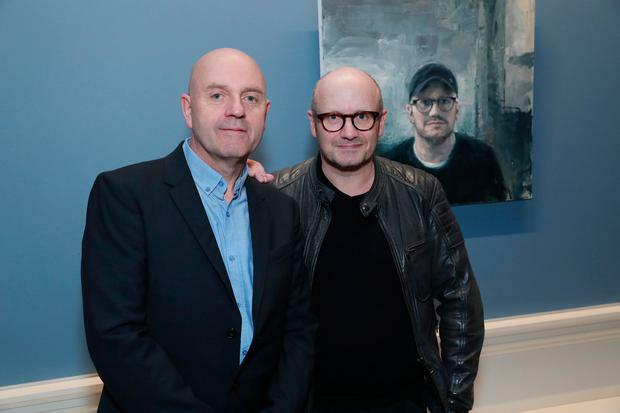 He's a world-renowned director, but Oscar-nominee Lenny Abrahamson had to learn to be directed for a starring role in the National Gallery of Ireland's newest portrait. "Being looked at that intensely for a couple of hours is odd and it takes a while to lose the initial self-consciousness," he said about sitting for artist Donald Teskey. "It put me on the other side of the lens in a way. I'm not used to being looked at. I'm used to looking at things. I'm very comfortable looking at other peoples' faces. "But he's a good director - he doesn't make you feel like you're being directed." Teskey said he was a big fan and jumped at the chance to create the painting. He knew straight away how he wanted to represent the director. "It was really that first meeting that I found that representation. He came in with the black cap and he seemed to exude that Lenny personality," he said. The painting is the latest addition to the gallery's National Portrait Collection, with Abrahamson's image now sitting alongside those of Bono, Graham Norton, Donal Lunny and Gay Byrne among others. It can be seen from today. He told the Herald the nerves of opening a film never really go away. "I do still get nervous. I am excited about it," he said. "You wonder what people will make of it when the curtains are drawn. But I feel good about the film." His next project will be a film on 1960s/70s bisexual boxer Emile Griffith.